The market, if it’s allowed to, can fix the affordability problem that exists in many cities in the US by finding price levels were first-time buyers can afford to buy a home with the income they’re making. 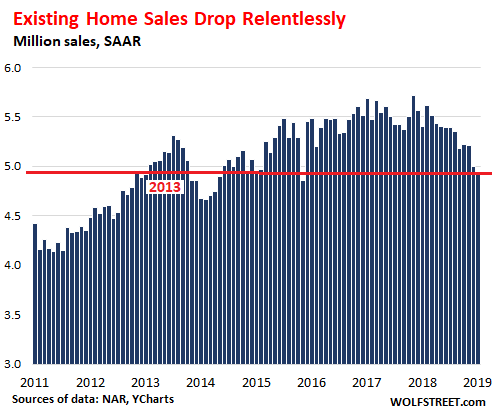 At its glacial pace, this is starting to happen in some markets, with sales volume dropping, and inventories rising, and sellers having to step down the aspirational ladder to make deals. In some of these markets, price levels have a long way to go before they make sense, where a household with a median income on the local scale can afford a median home. And there are now enough local housing markets that have turned south to where the impact is starting to creep into national averages. Northeast: -1.4%, to an annual rate of 700,000. Midwest: -7.9%, to an annual rate of 1.16 million. South: -8.4%, to an annual rate of 2.08 million. West: -13.8%, to an annual rate of 1.00 million. Declining sales and rising inventories are gingerly starting to have an impact on prices at the national level – something we have seen play out more brutally on a local level. 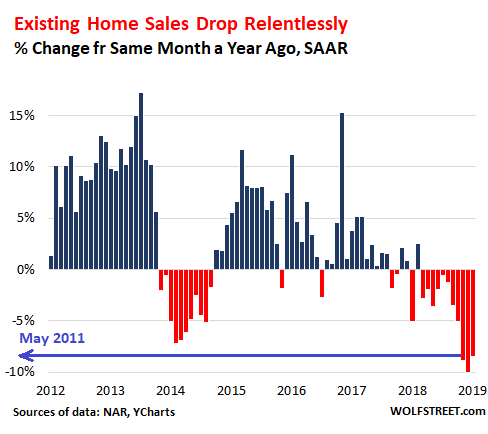 The chart above shows the disconnect: When nominal wages rise 2% to 3% and home prices surge 5% to 12% year after year, as they have done, sooner or later something has to give. Home prices cannot forever outrun wages – because it eliminates layer after layer of buyers. When there are no buyers at a price point, there is no sale. And for there to be a sale, the price has to come down. Northeast: +0.4%% year-over-year, to $270,000. South: + 2.5% year-over-year, to $214,800. West: +2.9% year-over-year, at $374,600. 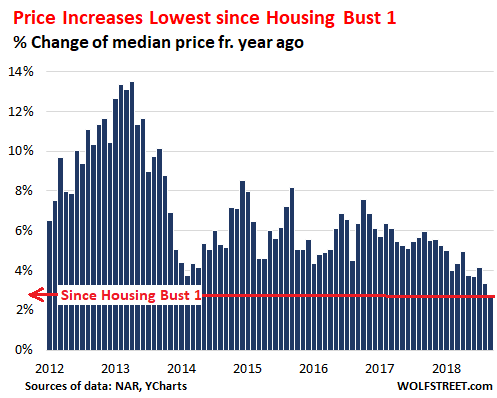 The disconnect between prices and where the buyers are was pointed out by the NAR report, though from a slightly different perspective. 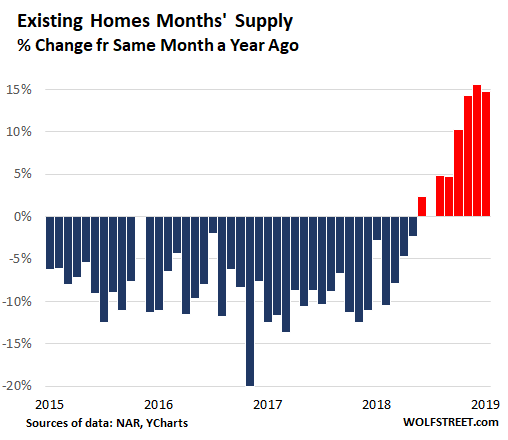 Inventories are rising and there is no shortage of housing per se, but it’s the wrong kind of inventory, after years of sharp price increases. “In particular, the lower end of the market is experiencing a greater shortage,” the NAR report explained. That “shortage” at the low end exists because prices have outrun incomes. There is no magic to it. The market can fix that when sellers are motivated enough to make deals and cut prices across the spectrum to where the buyers are. This doesn’t happen overnight. It happens over the years, market by market. And eventually it shows up in the national averages. There is a whole generation looking forward to the moment when they can afford to buy a home in these out-of-whack markets, though that’s still a while off. Those are the buyers of the future – and eventually prices will have to meet them. There are a host of other economic benefits triggered by lower home prices, such as buyers having more money left over to spend on other things, which would give other parts of the economy a sorely needed boost. Gradually unwinding some of the home-price inflation of recent years is not the end of the world.